The Maltese descends from on of the most ancient dog breeds to be found in recorded history.It has een estimated that the breed originated around 6,000 B.C., or 8,000 years ago. Although the ancient Greeks and Romans believed the dog originated on the Island or Malta--they called the breed the Melitaie Dog, Melitaie being the ancient name for Malta--there is really no evidence that proves the dog was indigenous to the Island, but rather that the Maltese is descended from a Spitz-type dog bred by the peoples of the area which is now south central Europe. The breed was eventually distributed as an exotic article of trade from the ancient island trading center of Malta, hence the name, and from there migrated by caravans to the farthest reaches of the civilized world, including:the Middle East, Tibet,China, he Philippines, and Japan. The Maltese descends from one of the most ancient dog breeds to be found in recorded history. It has been estimated that the breed originated around 6,000 B.C., or 8,000 years ago. Although the ancient Greeks and Romans believed the dog originated on the Island of Malta--they called the breed the Melitaie Dog, Melitaie being the ancient name for Malta--there is really no evidence that proves the dog was indigenous to the Island, but rather that the Maltese is descended from a Spitz-type dog bred by the peoples of the area which is now south central Europe. The breed was eventually distributed as an exotic article of trade from the ancient island trading center of Malta, hence the name, and from there migrated by caravans to the farthest reaches of the civilized world, including: the Middle East, Tibet, China, the Philippines, and Japan. The earliest known representations of Maltese dogs on artifacts found at Fayum, Egypt (600-300 B.C. ), suggest that the Maltese was one of the dogs worshipped by the ancient Egyptians. Numerous pictorial representations of the Maltese occur in Greek ceramic art, such as the vases found at Vulci (about 500 B.C. ), and the dog is mentioned in the writings of many Greek and Roman philosophers, and other ancient poets and historians, including: Aristotle, Timon, Callimachus, Aelian, Artimidorus, Epaminodus, Martial, Strabo, Pliny the Elder and Saint Clement of Alexandria. Notable ancient owners of Maltese include Roman Emperor Claudius and Publius, Roman governor of Malta. The Maltese emerged untarnished from the Dark Ages and continued to be recorded as the dog prized by the upper class, aristocrats, statespersons and royalty. The Maltese was even believed to possess medicinal powers of healing--the ailing would place the dog on their stomach or chest for comfort. Because of this practice, and the dogs warm, affectionate nature and small size, which made it easy to hold in ones arms or lap, the Maltese became known as the "Comforter." The dog was particularly popular in England during Elizabethan times (the late 16th century). Two notable owners of Maltese in those times were Queen Elizabeth I and Mary Queen of Scots. Beginning around the mid 1800's and into the early 1900's there was great debate among the noted dog writers and dog authorities concerning the question of "which dog family the Maltese belonged". A large group, especially the dog fanciers of England, felt that the Maltese belonged in the Terrier family due to their terrier-like temperament. As with the English terrier breeds, the Maltese of the period was an excellent ratter and exhibited great fearlessness, despite his small size. Others disagreed and felt that the Maltese, because of his body and coat type, were spaniel in nature. Ultimately, in the early 1900's, it was concluded that the "Maltese dog" was neither terrier or spaniel. Rather, he should correctly be referred to as the "Maltese dog". 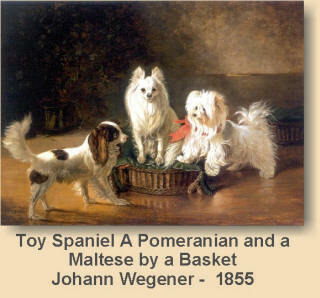 In 1862, 20 Maltese were exhibited at a show in London. The Kennel Club (England) was established in 1873. One of the first functions of that body was to establish a stud book. 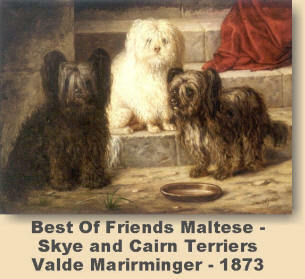 The first English stud book has twenty-four Maltese registered between 1859 and 1873. A very famous breeder from 1875 through 1885 was Lady Giffard, whose dogs were noted for their long silky coats. Two of her most famous dogs were four-pound "Hugh" and his litter sister, three pound "Queenie". From 1902 to 1913 The Kennel Club offered classes for Maltese dogs, other than white. The first entry made under this classification was made in 1908 and the last was made in 1913. The colored Maltese differed from the white variety. The English standard for the Maltese called for the white variety not to exceed 12 pounds. The colored variety could not exceed 8 1/2 pounds. All colors were admissible into the colored classes. The white variety were required to be pure white. Besides the size difference, there were other variations between the two varieties. The colored coats were coarser textured than the white coats. The head of the colored Maltese tended to be shorter muzzled and broader skulled than those of the white Maltese. The earliest known Maltese on record in the United States was born in 1873. He was entered at Westminster in 1879 and was also the first colored Maltese shown here. 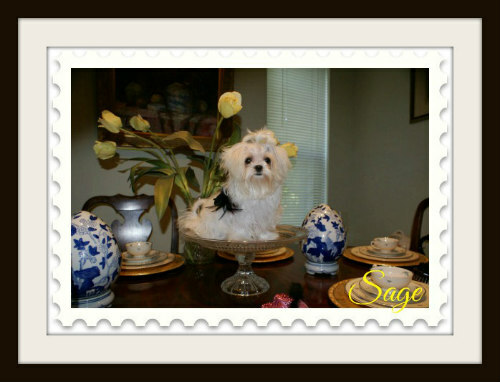 Entered as a "Maltese Skye Terrier," he was described as being white with black ears. There was great interest in colored Maltese in the United States. Some crossbreeding was done here, as well as in England. One such recorded crossbreeding used a white Maltese and a black Pomeranian. The resultant litter produced black Maltese, identical to the white variety. From 1900 through 1910, there were numerous Poodle kennels throughout America involved in Maltese. Crossbreeding between these two breeds was frequent and it is likely that the Maltese was used to lock in the small size, color, and pigmentation. White Toy Poodles were among the first acclaimed in the show ring. Some of the undesirable results of those crossbreedings have lingered to this day. The Toy Poodle has difficulty with "round" eye instead of the almond shaped eyes called for in their standard. 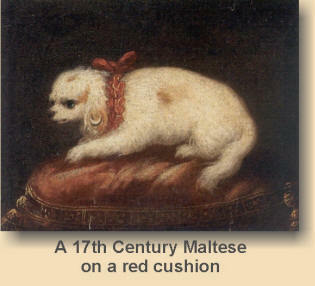 On the Maltese side of the issue, an incorrect "poodle-like" coat texture can be found in some Maltese.